Following my last post, I put aside the things which were not going to plan, and started these. Plain vanilla socks, fun self patterning yarn (Regia) - a case of sitting back, and zoning out to the simple pleasure of 2mm (Chiaogoo ) needles between the fingers. It turns out that simple mindless knitting was exactly what I needed. A pair of vanilla socks on my favourite needles has become my 'go to' project. No need to think about tension, following a pattern or anything else - I could probably make these with my eyes closed. Perfect relaxation... and a step closer to having a whole week's worth of handknit socks before the cold weather returns. Do you have a 'go-to' pattern? Gorgeous yarn! As you know my go to project is always socks.Perfectly portable and almost meditative knitting. It keeps my mojo between indecision which I am very prone to. Vanilla socks. Soothing project. Great color way, a happy one. I haven't had an on-the-go project for quite some time since the written word has me sucked in. 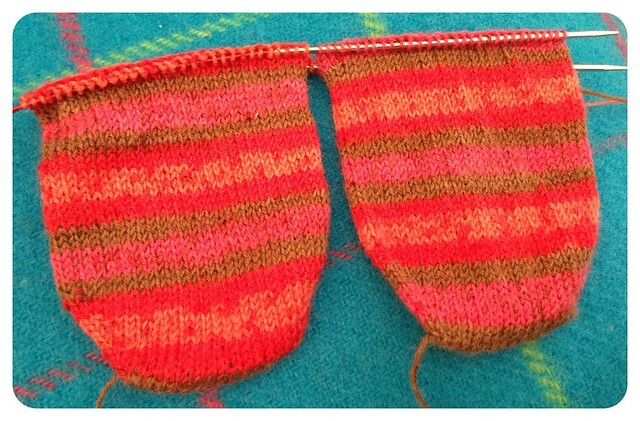 As for sock pattern, I love Ann Budd's 8 sts per inch one but that's for cuff down. Now toe up is my way to go for socks because they fit better. I only have the book, Teach Yourself Visually Sock Knitting - pattern to go by. Can you convert it to knit toe-up? At the moment, it would probably be Innocent Hats for their Big Knit. Simple enough pattern. Lovely pattern Alicia! I hate counting too which is why I always knit two at a time and then I just measure against my hand to know when to increase for the gusset (fingertips to heel of hand = toe to gusset length).